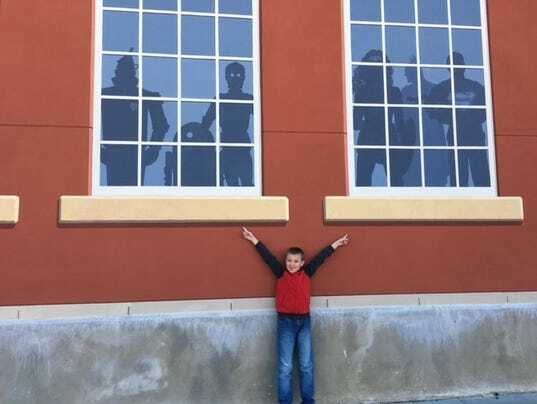 Eli Martin, 7, of Shelby, poses with his favorite movie 'Star Wars' characters painted as silhouettes in windows in a new mural in the Schines Art Park at South Sandusky Avenue and Warren Street. The outdoor movie park was dedicated Friday. Martin's grandparents Doug and Linda Godwin run the furniture store on the other side of the wall. The Schines Art Park in Bucyrus was dedicated Friday at South Sandusky Avenue and Warren Street. People will be able to watch outdoor movies at the park. The lot was formerly home to the Schines Bucyrus Theater.